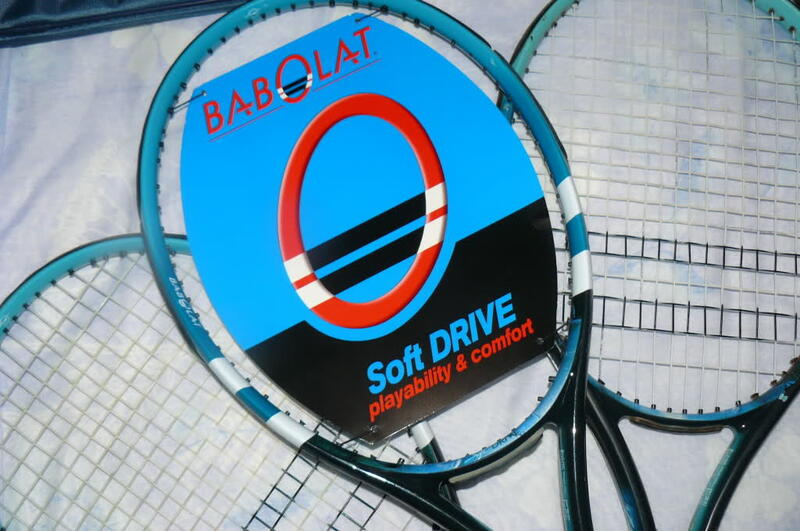 Not too long ago I wrote about my switch to the Babolat Soft Drive for competitive play. Since then I have been testing a few other racquets which have made me change my mind. So here is the Tennisnerd racket of choice vol 2! It is about a niggling wrist pain (not sure it is the racquet because it felt comfortable during and after sessions). Plus the feeling that I needed to add more weight to get that really solid feeling (which makes a 100 sq inch racquet hard to manuever) that older racquets often have, made me decide not to. I still think it deserves all the praise I gave it. Still, there are a few things I have noticed lately about my game that makes it not quite right for me. The Soft Drive is a great stick too, but my best tennis is when I take the ball early and aggressively and feel a hundred percent in control of launch angle, depth etc. So, in looking for a more traditional frame again I stumbled upon the PT57A. I have wrItten a few posts about the HEAD pro stock racquet PT57A before. It is based on the 20-year-old HEAD Pro Tour 630 (280 in the US) that has been used for years in various forms by pro players such as Guga Kuerten, Andy Murray, Tomas Muster, Tommy Haas, Gilles Simon, Robin Soderling, Robin Haase (recently switched from PT10) and many other professional tennis players. It is hailed by many as the ”holy grail” of tennis racquets and nets high prices on racquet websites and forums. I currently have three PT57A in my possession and I posted this on Instagram a few days ago. In the comment field I urged people to pitch in their experience and to my surprise Andy Murray chimed in and wrote ”Trust me, it’s a decent racket.” A nice surprised for a tennis nerd, and a statement that rings especially true since Murray has used the racquet in 16×19 string pattern for pretty much his entire adult career. 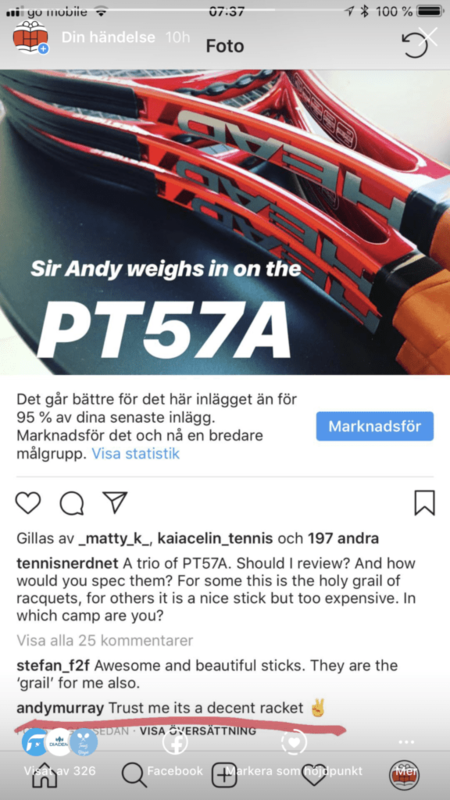 I have played the PT57A before, it is one of those racquets you keep coming back to. The reason is that with the PT57A you have a beautiful sensation when you hit the ball in the sweet spot. The sweet spot is not large, but the way the ball sinks into the string bed when you hit it is a feeling that many racquet manufacturers have tried to duplicate. Wilson with the pro stock H19 (closest retail racquet would be Wilson Ultra Tour , read my review here), Tecnifibre with their commercially available Tfight 315 Limited etc. 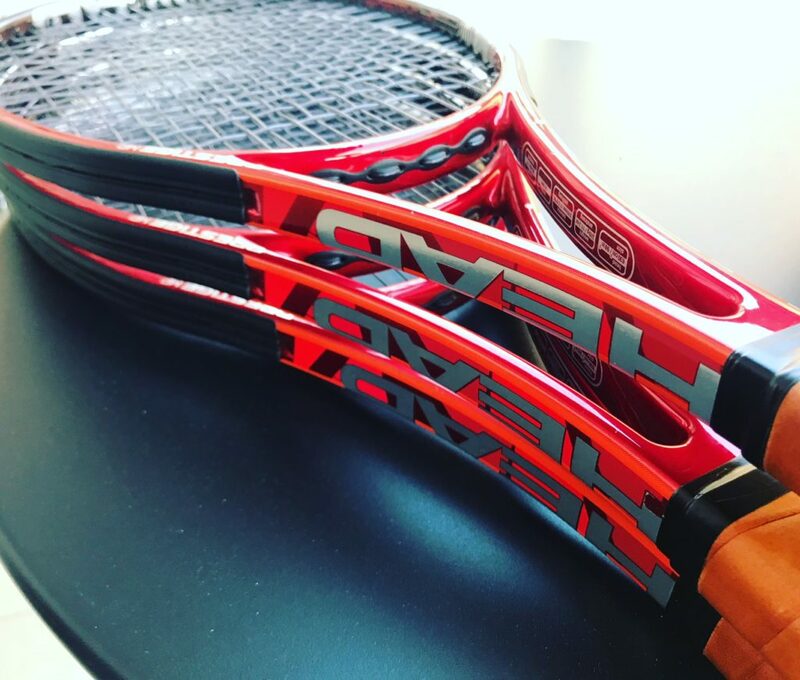 The PT57A is as much of a control racquet as it gets. Strung and customized in the right way it gives you pinpoint precision, but the power and spin is on tap if you have the technique for it. 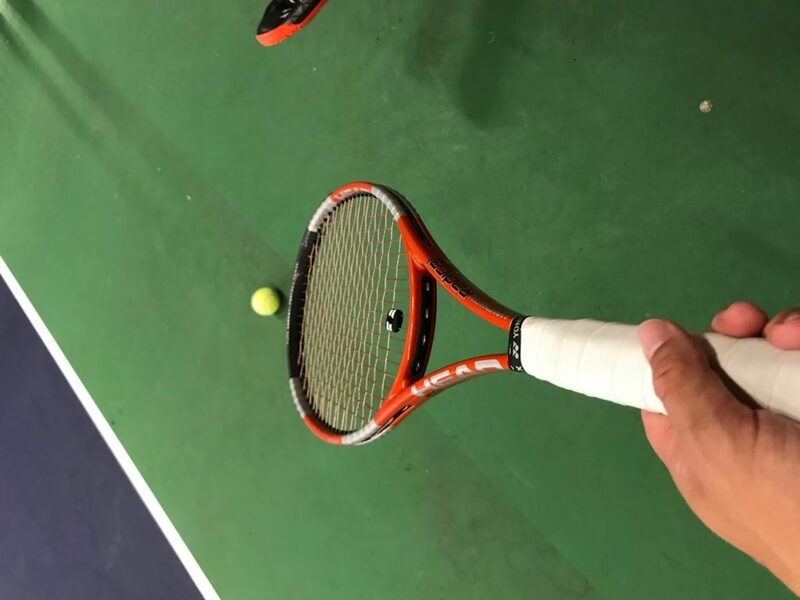 It is definitely not a racquet for the faint of heart as you need to play with good footwork and mechanics to benefit. 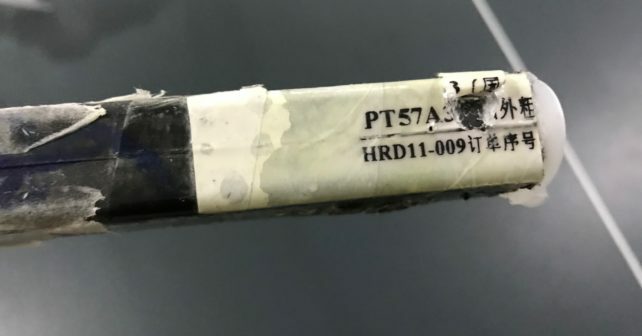 Also, even if the PT57A comes in at around 300 grams unstrung and uncustomized, you definitely need to add lead tape and potentially silicone in the handle to make it play with authority. My goal weight (sounds like I am in a weight loss program) for a 95 sq inch racquet is always around 350-355 grams strung with 32-ish cm balance (6 pts head light) so I had to beef it up. The rectangular grip shape of the TK76 pallets are not great for my game either (the one-hander suffers!) so I switched one racquet to a TK82S pallet to test. Last but not least, I strung up the racquet with HEAD Rip Control , a praise multifilament string which I have not tested before. The issue for me with the string choice is that I like a dead response from the string bed. That is why I usually go for a full poly setup. I have tried many hybrids, synthetic gut and multifilament strings but always seem to fall back on the poly. After a few outings I can say I am ready to cut out the Rip control and install RS Lyon or HEAD Hawk Touch. It might not be the fault of the string but it feels a bit unpredictable in the PT57A. If I can find a setup I like with the PT57A, it might be my next racquet of choice. Until then, I am playing pretty much all my non-review tennis with my HEAD Liquidmetal Radical Tours (read my review). For a while I was going to sell them all, but I just keep coming back to that ultra-reliable and stable feel. It definitely lacks the touch and finesse of the PT57A, because on drop shots and volleys that is such a brilliant racquet, but the Radical has more power and a bigger sweet spot. So if you can swing it (mine weighs 354 grams strung with overgrip but without dampener) – it is easier to use. I might not be hitting with massive spin or pace with my Radicals, but the racquet feels right in my hand. For a guy who tests and reviews so many racquets, this is incredibly important. It is like returning home after a long but enjoyable trip. I really enjoy the Soft Drive too so it is a tough battle between them, but with that racquet I need to adapt my technique a bit to dial down the power and launch angle. The Radical Tour gives me pretty much nothing for free but for a racquetholic it gives me the opportunity to forget about the racquet and focus on my game. When I play with the Radical Tour, I know what to expect and any shortcomings are of my own doing and cannot be blamed on me not “gelling” with the racquet. That makes me want to work on my technique and movement more, which is what I need to do to become a better player. So for now my bag is populated with a couple of Radical Tours, a PT57A that I am testing and a couple of Soft Drives. In case I need some help with depth and spin. That racquet is definitely easier to use when I am not moving and became a natural choice during my knee injury. Now that I am feeling and moving better and can generate more power from my legs, a more low-powered racquet seems to work better for me. Besides the PT57A, I also have an upcoming review of the Tecnifibre Powerstab 300 that Chris Edwards of Tennis Warehouse switched to. I am curious to see how it plays compared to the Soft Drive. After that I will be looking into the new VCOREs from Yonex, and later on the new Pure Aero. As always, thanks for reading the blog and watching my humble video content. Any share and like is appreciated and I love reading your comments. Since there are quite a lot of them it might take time to reply to them all, but that is always my ambition. Time to head out to the practice court! Enjoy your tennis wherever in the world you are! I always revert back to my dunlop 200 4D Tour. Playing with new Ezone 98 for a different switch up and enjoying it more and more. I have left yonex twice and won’t be leaving again. Played with the RQIS 95 and 100XL (also 95 sq in) prior to the Vcore Tour 97 (330) then spent some time with the head speed IG, babolat aerostorm and aeropro, Prince 730 longbody, Angell TC97 16×19. Of all of my straying the Angell was far and away the best racquet on the market and if it were easier to get in the USA I would have stuck to them in an 18×20. However I always end up back and yonex. If you are looking for a soft poly I recommend Laserfibres native, super plush and feel for days. I’m about to try out the Laserfibre JB 100 Tour and Tourna’s new Grit. I will keep you posted. Songs for a dead pilot. Today tested two PT10 I’ve bought recently againts IG Prestige Mid. I must admit I do prefer the Prestige Classic 600 as it is more powerful, more stable and has much better feel. Can’t compare to other Mids from Head history (Liquidmetal or Microgel/YT) – but I love this one! Also it is much better and easier for me than TGT312.1 – prostock version of modern Prestige RevPro/Mid. I have two PT57A in Graphene XT painjob and I can confirm – the feel and power is there. However I do struggle with little sweetspot – hence I played only a few hours with it. Need to give it a try again! Also hope to get 16×19 edition later this year. Regarding the retail rackets – I do love Liquidmetal Radical MP. So solid, stable and nice feel despite higher RA ratings. Also Microgel Radical MP is fine, especially the super soft and powerful TGK231.1. No wonder Marin Cilic loved them in 16×19. Do you find H19 and H22 similar to best PT57 mold and Radicals? They seemed to me to have bigger head sizes. But I do loved their power and stability. I have been playing with the PT57A for about 5 months now. I have changed my lead and strings countless times trying to find my favorite setup. I have to say that I have the opinion that the raquet benefits much more from tape placed up top. I especially like the tape from 3 all over the top to 9, just like Andy Murray does it. I play with silicone in the handle. The only thing I question is what weight and balance I should be playing it at. Most of the pros you named play the frame around 350 grams and a 34cm balance. But I’ve noticed so much extra power and stability if you go up to 365 grams! It’s a lot to swing that way though. Soderling weighed his with tape all around the frame with almost and even balance. I tried that and started to have arm problems. Lol! Let us know what setup you like best! It is a racquet that definitely requires weight. I got mine at 337 grams strung and that is not nearly enough for the racquet to play well in my opinion. I am up to 354 grams, but I still prefer my Radical Tours for more stability and a generous sweet spot. Nice collection! The PT57A is definitely not easy to use. At the moment I still prefer my HEAD Liquidmetal Radical Tours (which actually has “H22” on the hair pin), but might need more time to dial in the setup. The feel is great on the PT57A, but the sweet spot is small. Yes, H19 and H22 are quite similar. The head sizes are 97 with Wilson so about two sq inches bigger, not a huge deal however. I have played with a head youtek ig prestige mg, grip tk82s, 6g lead tape in 12h, balance 32.7cm, string solinco hyper g 1.25mm, grip babolat skin feel, overgrip wilson pro, totaling 341g. I get a chance to buy a pair of head liquidmental radical tour mp, do you think it’s worth the change? The IG Prestige MP with your modifications will not be very different from the HEAD LM Radical Tour so if you like the Prestige, stick with that one.